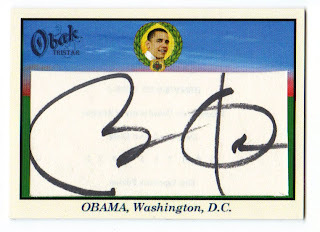 Just when you thought The Hobby had about enough of Barack Obama, his Tri-Star Obak 1-of-1 cut autograph has hit eBay and coincidentally was pulled by a collector not far from my house. I certainly hope that this trend dies down sooner than later as I am pretty sick of seeing him inserted into seemingly every product since his candidacy began. You can see the auction here. His auto is almost as big as his ego. Geez, you're the President of the United States. How about signing your full name when you sign something.